The first ground based infrared spectrum of Jupiter's moon Amalthea reveals that it must have formed far from its current location. This new result, based on observations with the Subaru telescope and the NASA Infrared Telescope Facility by a team of researchers from the National Astronomical Observatory of Japan, the University of Hawaii, and the University of Tokyo, sheds new light on our Solar System's turbulent past. The Coronagraphic Imager with Adaptive Optics (CIAO) on the Subaru telescope captured this near-infrared (wavelengths of 1.25 - 2.2 microns) image of a star at the end of its life. BD +303639 is a planetary nebula, similar to the Ring Nebula in the constellation Lyra, the Harp. It is about five thousand light years from Earth in the direction of the constellation Cygnus, the Swan. 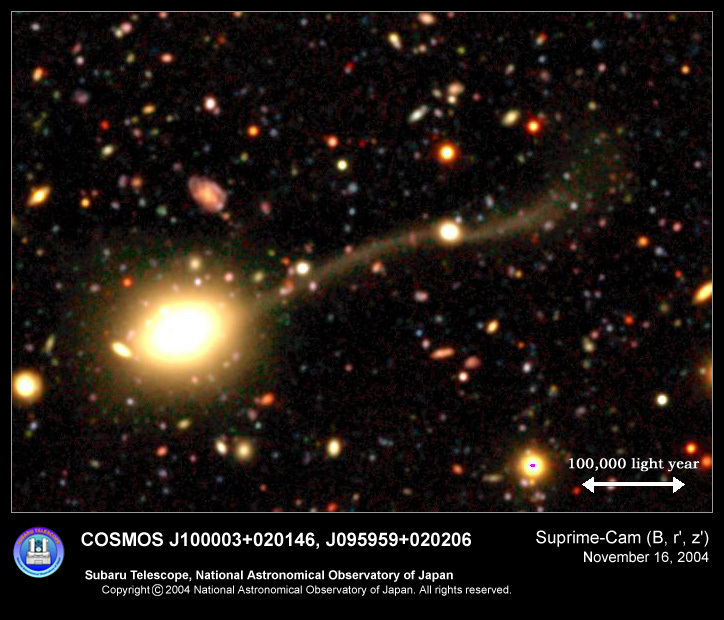 Subaru telescope has witnessed a large galaxy in the act of devouring a small companion galaxy in a new image obtained by Yoshiaki Taniguchi (Tohoku University), Shunji Sasaki (Tohoku University), Nick Scoville (California Institute of Technology) and colleagues. The evidence is a wispy band of stars extending over 500 thousand light years, the faintest and longest known example of its kind. A team of researchers from Ibaraki University, ISAS, University of Tokyo, and National Astronomical Observatory of Japan has succeeded in revealing details of the dust disk around beta Pictoris, which shows evidence of a planetary system. The team concludes that there is a "grain replenishment region" consisting of ring or belt like distribution of rocky bodies called planetesimals. Astronomers have shown for the first time that even the smallest galaxies in the Universe have complex structures that indicate a complex history. Using the Subaru Telescope, a team of astronomers from the National Astronomical Observatory of Japan, the Institute of Physics in Lithuania, the University of Durham, Paris Observatory, Kyoto University, Gunma Astronomical Observatory, and the University of Tokyo have discovered an extended halo of stars with a sharp cutoff in the dwarf irregular galaxy Leo A, a member of the Local Group of galaxies that includes the Milky Way. On top the windswept summit of a Hawaiian volcano, a NASA instrument attached to the Japanese Subaru telescope measured distant winds raging on a strange world -- Titan, the giant moon of Saturn -- to help the robotic Huygens probe as it descends through Titan's murky atmosphere next January. At a press conference held on 3 PM (JST), June 1, 2004, in Tokyo Japan, the National Astronomical Observatory of Japan (NAOJ) unveiled visible, X-ray, and radio wavelength images of the Subaru/XMM-Newton Deep Survey, based on data from the Subaru telescope, the European Space Agency's (ESA) XMM-Newton satellite and the Very Large Array. SXDS provides a comprehensive population census of galaxies from the early Universe to the present. New high resolution near-infrared direct imaging of the protoplanetary disk surrounding the star AB Aurigae shows that this planetary nursery is not the comparatively featureless and smooth place that astronomers had once assumed, but a place where gas and dust swirl in a complex spiral pattern. The new observations are part of a project to study the immediate neighborhood of young stars with greater detail than ever before by combining the large 8.2 meter effective aperture of the Subaru telescope with adaptive optics and a coronagraphic imager. Near infrared spectroscopic observation of Comet LINEAR (C/2002T7), which will approach the Earth in May 2004 and it is expected to be very bright, was carried out with the Subaru Telescope in September 2003. After analyzing the spectral data, we discovered water icy grains in the coma of Comet LINEAR. Comet Hale-Bopp is the first example of the detection of water icy grains in a cometary coma, and this time is the second one. Young blue stars and older yellow and red stars shine against a dark sky like jewels in a treasure chest in this image of Sextans A from Subaru Telescope’s prime focus camera Suprime-Cam. Sextans A is a dwarf irregular galaxy belonging to a group of galaxies called the Antlia-Sextans group 5 million light years from Earth. Even though five million light years is quite distant, only about 40 galaxies are closer to our own Milky Way galaxy than Sextans A. The Antlia-Sextans group is the closest neighbor of the Local Group..